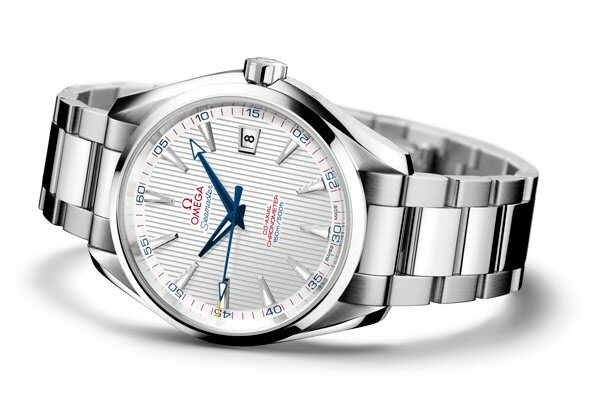 OMEGA has created the Seamaster Aqua Terra “Captain’s Watch” in celebration of this year’s Ryder Cup. The special edition will be worn by American Ryder Cup team captain and OMEGA brand ambassador Davis Love III. Love, whose twenty PGA Tour victories include the PGA Championship in 1997, has been a part of six U.S. Ryder Cup teams, winning the cup in 1993 and 1999. OMEGA will be serving as Official Timekeeper of the Ryder Cup for the first time in September within the scope of its partnership with The PGA of America. The tournament, which is one of the most popular and hotly anticipated events on the golfing calendar, is a competition between teams from Europe and the United States contested every two years, alternating between American and European courses. There is no prize money involved – the best golfers in the world compete purely for the victory. The Seamaster Aqua Terra “Captain’s Watch” has a 41.50 mm brushed and polished stainless steel case with a polished bezel. Its polished screw-in caseback has a sapphire crystal that allows a clear view of the watch’s movement. The silver dial has the vertical “teak-pattern” lines that characterize the watches in the Aqua Terra collection. Brushed and polished 18 Ct white gold indexes mark eleven of the hours; there is a date window at 3 o’clock. The watch has distinctive facetted blue hands that are coated with Super-LumiNova, making them legible in all lighting conditions; the central seconds hand has a yellow tip. The OMEGA logo on the dial and the words “CO-AXIAL CHRONOMETER” are red as are the non-numeral markers on the minute track. “Seamaster”, “150m/500ft” and the numerals on the minute track are blue. These colors against the silver background of the dial subtly recall Davis Love III’s national flag. The stainless steel screw-and-pin bracelet has brushed outer links and polished center links. The OMEGA Seamaster Aqua Terra “Captain’s Watch” is water resistant to 15 bar / 150 metres / 500 feet.